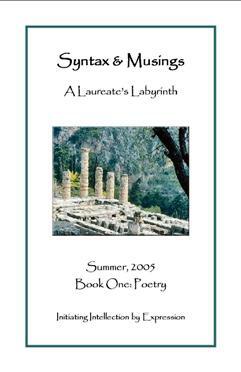 Below, you'll find items for sale at Mosaic Musings, LLC. Thanks for your interest and consideration! The prices for purchases in our Market will vary by product, item and quantity ordered. All orders placed must be paid in U.S. funds online (with PayPal) by credit card or eCheck; check or money order (by mail). Foreign currencies are not permitted. Payments should be made payable to: Mosaic Musings, LLC. 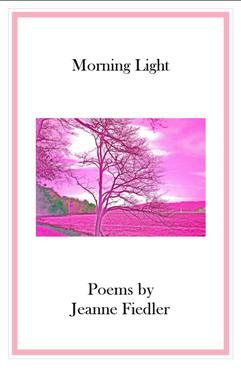 Inside this 44 page chapbook compilation by Jeanne Fiedler, you'll find 27 page-turning poems filled with themes that take you through visions of stillness, bliss, sadness and joy, while connecting you to The Divine; an experience of wholeness, bittersweet emotions and perfect love. "Poetry helps me see through shallowness; and when connected to the earth, I glimpse the eternal in everything. When you experience tragedies as I have, seeing the world behind a soft opaque light helps me appreciate the wonderment of life." Mosaic Musings, LLC does not hold any copyrights to the works contained within this publication. This chapbook features 28 pd. gloss white stock and 67 pd. parchment lavender cover. Order your copy today! Inside this 52 page chapbook compilation by John L. Yelavich, you'll find 40 page-turning poems filled with the wayward traveler’s experiences on life’s highway. In this, John’s fifth published chapbook, you’ll enjoy mile markers along this freeway represented by the stages of our evolution, from the fantasies of adolescence, to the sobering, cherished vignettes of our final chapters. “For many of us, we have found that evasive, quiescent clarity. We have experienced nature’s changing flavors: Spring, the season of promise; Summer, the season of growth; Autumn, the season of abundant harvest; and Winter, the season of faith. We now await Fate’s Haven". Mosaic Musings, LLC does not hold any copyrights to the works contained within this publication. This chapbook features 28 pd. gloss white stock and 67 pd. parchment natural cover. Order your copy today! 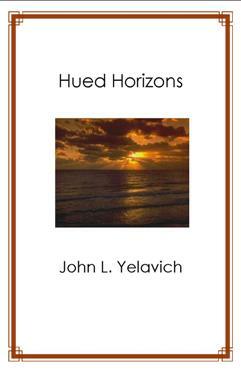 Inside this 52 page chapbook compilation by John L. Yelavich, you'll find 38 page-turning poems filled with the beauty of life’s majesty to rejoice and ponder. In this, John’s fourth published chapbook, enjoy a welcome mat framed by landscape’s humble vistas, where romanticized fantasies are colored by John’s cherished melodies and lyrical themes. “There may be no fire tonight but tomorrow awakens a new frontier, endowing us to be enraptured Dream-Hunters.” Mosaic Musings, LLC does not hold any copyrights to the works contained within this publication. This chapbook features 28 pd. gloss white stock and 67 pd. parchment natural cover. 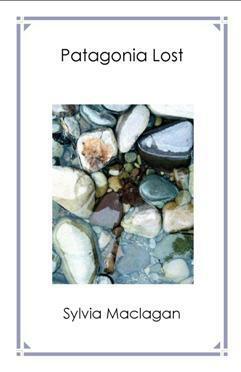 Inside this 104 page chapbook collection by Sylvia Maclagan (sold as a two book set only), you'll find 46 page-turning poems (with 13 equally impressive photographs of Patagonian sights) that emphasize ecological climate changes taken from the author’s personal experiences. Take a trip through the mystical land of Patagonia and witness the imagery Sylvia describes through vivid word pictures. Dan Newland, former Editor-in-Chief of the Buenos Aires Herald, eloquently summarizes this collection as follows; “Her poems capture the essence of the terrain: wide open yet somehow oppressive, raw yet gentle, desolate yet comforting, a land of contradiction and emotions that elicit both a rare joy and a persistent lump in one's throat. There is, in the almost solidified blue of the sky in the Patagonian steppes, a hint of something more that lies just beyond, a glimpse of infinity, a fleeting promise of immortality.” Mosaic Musings, LLC does not hold any copyrights to the works contained within this publication. This chapbook features 28 pd. gloss white stock and 67 pd. parchment green cover. Order your copies today! 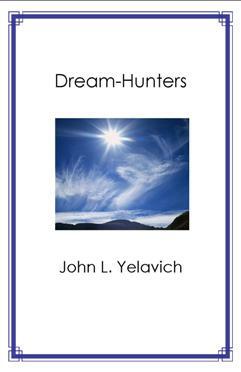 Inside this 52 page chapbook compilation by John L. Yelavich, you'll find 39 page-turning poems filled with themes that both radiate and energize our souls. Imagination can crystallize our visions, and determination brings us closer to destiny’s design. In John's third published chapbook, you'll take a journey through Blissful Bonds, Idyllic Perceptions and Bittersweet Shadows. Mosaic Musings, LLC does not hold any copyrights to the works contained within this publication. This chapbook features 28 pd. gloss white stock and 67 pd. parchment natural cover. Order your copy today! 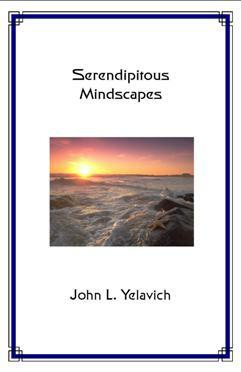 Inside this 48 page chapbook compilation by John L. Yelavich, you'll find 34 page-turning poems filled with myriad opportunities to stimulate senses and broaden perspectives that lead to a tranquil state of love, peace and serenity. In John's second published chapbook, you'll take a journey through Enraptured Sensations, Joyous Melange and Cryptic Oddments. Mosaic Musings, LLC does not hold any copyrights to the works contained within this publication. This chapbook features 28 pd. gloss white stock and 67 pd. parchment natural cover. Order your copy today! 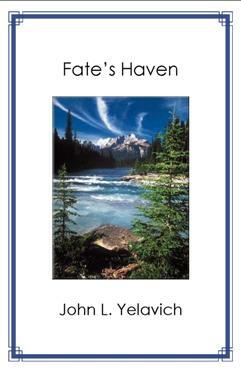 Inside this 52 page chapbook compilation by John L. Yelavich, you'll find 40 page-turning poems filled with an epiphanous light that has diffused psychic surrealistic shadows to reveal a myriad of vivid idyllic mindscapes filled with images of love; faith; hope; merriment; and natural treasures. In John's first published chapbook, you'll take a journey through Psychic Visions, Sweet Raptures, Picturesque Vistas and Mirthful Miscellanea. 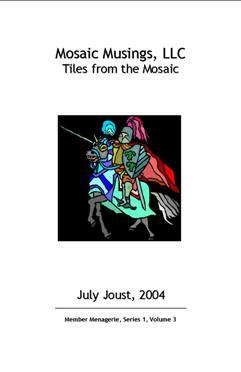 Mosaic Musings, LLC does not hold any copyrights to the works contained within this publication. This chapbook features 28 pd. gloss white stock and 67 pd. parchment natural cover. Order your copy today! 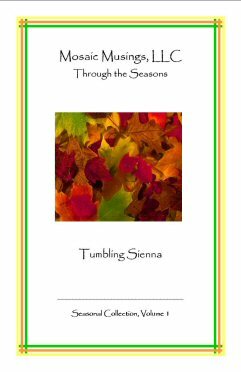 Inside this 36 page (40 total pages) chapbook, you'll find a compilation of 27 poems created by 13 of our members for the season of Autumn, 2004. Their varied styles and talents are guaranteed to bring out a kaleidoscope of crisp colors to your Autumn palette! From waltzing leaves to prowling pumpkins and hoblin' Goblins to politically correct football in the red zone, our colorful and bewitching moments will sure delight! 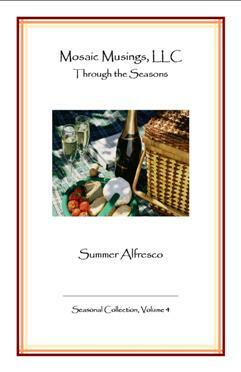 Mosaic Musings, LLC does not hold any copyrights to the works contained within this publication. This chapbook features 28 pd. gloss white stock and 67 pd. parchment ancient gold cover. Order your copy today! 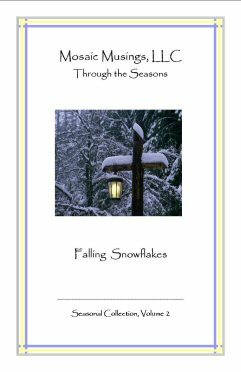 Inside this 44 page (48 total pages) chapbook, you'll find a compilation of 19 poems and 5 short stories created by 13 of our members for the season of Winter, 2004. Their varied styles and talents are guaranteed to spark an emotional response and ring in the holiday spirit of your Winter muse! From winter dreams to sno-boards, and twinkling twilights to Angels, from frozen sculptures to falling flakes, our collection is guaranteed to bring a smile and a tear! Mosaic Musings, LLC does not hold any copyrights to the works contained within this publication. This chapbook features 28 pd. gloss white stock and 67 pd. white cover. Order your copy today! 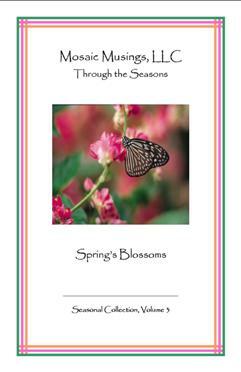 Inside this 26 page (32 total pages) chapbook, you'll find a compilation of 22 poems (with 11 color images) created by 14 of our members for the season of Spring, 2005. Their varied styles and talents are guaranteed to bring out a kaleidoscope of warm colors to your Spring palette! From sugar pink blooms to nesting birds' welcomesong to waltzing bees and clover's crops to dancing daffodils, our 'springtime samba' will sure delight! Mosaic Musings, LLC does not hold any copyrights to the works contained within this publication. This chapbook features 28 pd. gloss white stock and 67 pd. pastel pink cover. Inside this 48 page (52 total pages + cover) chapbook, you'll find a compilation of 37 poems with 24 color images created by 34 of our members for the Summer 2005 newsletter. Their varied styles and talents are guaranteed to bring out a kaleidoscope of colossal emotions to your aMUSing palette! From pink things to midsummer bonfires, and stargazers to midnight odysseys, our colorful moments will sure delight! Mosaic Musings, LLC does not hold any copyrights to the works contained within this publication. This chapbook features 28 pd. gloss white stock and 67 pd. parchment pastel green cover. Order your copy today! Inside this 44 page (48 total pages + cover) chapbook, you'll find a compilation of 11 short stories with 4 color images created by 11 of our members for the Summer 2005 newsletter. Their varied styles and talents are guaranteed to bring out a kaleidoscope of colossal emotions to your aMUSing palette! From gardening grandmaster monks to mystical train stations, and summer scrumping to 'special' runners, our colorful moments will sure delight! Mosaic Musings, LLC does not hold any copyrights to the works contained within this publication. This chapbook features 28 pd. gloss white stock and 67 pd. parchment pastel green cover. Order your copy today! Monthly, our members are given a writing challenge containing specific requirements to be met. 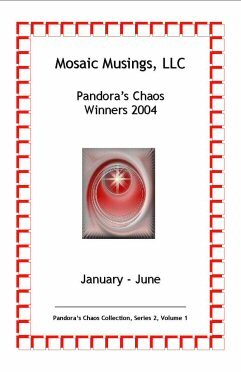 Inside this 24 page (28 pages total) chapbook, you'll find a compilation of Pandora's Chaos Winners for our first calendar year, 2003. Unleashing chaos, these writers conquered Pandora on her random quests and rose above, leading their Muses to victory. Challenges utilize images, poetic styles, key words, short story snippets, famous poems and more! Mosaic Musings, LLC does not hold any copyrights to the works contained within this publication. This chapbook features 28 pd. gloss white stock and 67 pd. cream cover. Order your copy today! Monthly, our members are given a writing challenge containing specific requirements to be met. Inside this 40 page (44 total pages) chapbook, you'll find a compilation of Pandora's Chaos Winners for our first half-year, 2004. Unleashing chaos, these writers conquered Pandora on her random quests and rose above, leading their Muses to victory. Challenges utilize images, poetic styles, key words, short story snippets, famous poems and more! Mosaic Musings, LLC does not hold any copyrights to the works contained within this publication. This chapbook features 28 pd. gloss white stock and 67 pd. gray cover. Order your copy today! Inside this 40 page (44 pages total) chapbook, you'll find a compilation of poems and short stories created by our members in the month May, 2004. Their varied styles and talents are guaranteed to spark an emotional response! Mosaic Musings, LLC does not hold any copyrights to the works contained within this publication. This chapbook features 28 pd. gloss white stock and 67 pd. cream cover. Order your copy today! Inside this 44 page (48 pages total) chapbook, you'll find a compilation of poems and short stories created by our members in the month June, 2004. Their varied styles and talents are guaranteed to spark an emotional response! 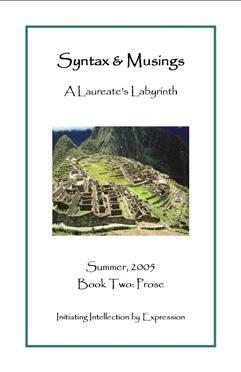 Mosaic Musings, LLC does not hold any copyrights to the works contained within this publication. This chapbook features 28 pd. gloss white stock and 67 pd. pastel yellow cover. Order your copy today! Inside this 36 page (40 pages total) chapbook, you'll find a compilation of poems and short stories created by our members in the month July, 2004. Their varied styles and talents are guaranteed to spark an emotional response! Mosaic Musings, LLC does not hold any copyrights to the works contained within this publication. This chapbook features 28 pd. gloss white stock and 67 pd. pastel blue cover. Order your copy today! Inside this 44 page (52 pages total) chapbook, you'll find a compilation of poems and short stories created by our members in the month August, 2004. Their varied styles and talents are guaranteed to spark an emotional response! Mosaic Musings, LLC does not hold any copyrights to the works contained within this publication. This chapbook features 28 pd. gloss white stock and 67 pd. orange cover. Order your copy today! Save 14 % off the cover price of our U PIC Duopack chapbook collection! Choose any two chapbooks and create your own Duopack. Mosaic Musings, LLC does not hold any copyrights to the works contained within these publications. Mark your choices at checkout in the "notes" box or simply wait for the comfirmation of choices email from Mosaic Musings. You call also email your selections to the site owner. These chapbooks features 28 pd. gloss white stock and 67 pd. covers. Order your U PIC Duopack today! Save 19 % off the cover price of our U PIC Tripack chapbook collection! Choose any three chapbooks and create your own Tripack. 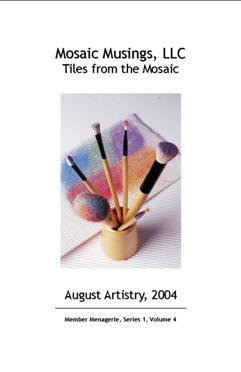 Mosaic Musings, LLC does not hold any copyrights to the works contained within these publications. Mark your choices at checkout in the "notes" box or simply wait for the comfirmation of choices email from Mosaic Musings. You call also email your selections to the site owner. These chapbooks features 28 pd. gloss white stock and 67 pd. covers. Order your U PIC Tripack today! Save 24 % off the cover price of our U PIC Quadpack chapbook collection! Choose any four chapbooks and create your own Quadpack. Mosaic Musings, LLC does not hold any copyrights to the works contained within these publications. Mark your choices at checkout in the "notes" box or simply wait for the comfirmation of choices email from Mosaic Musings. You call also email your selections to the site owner. These chapbooks features 28 pd. gloss white stock and 67 pd. covers. Order your U PIC Quadpack today! Save 25 % off the cover price of our Chapbook of the Month! Choose this item and receive the discount. Mosaic Musings, LLC does not hold any copyrights to the works contained within these publications. To view the selections each month, please visit our forum thread by clicking here. These chapbooks features 28 pd. gloss white stock and 67 pd. covers. Order your Chapbook of the Month today! USA Orders = $1.50, Canada Orders = $2.00 and International Orders = $3.00. 2. You will be sent an email confirmation once payment has been processed. 5. Once payment has been verified, your purchase(s) will be mailed via USPS. 6. Note: All chapbook orders are printed on demand.